This bariatric true low air loss mattress system provides all of the benefits of the standard true low air loss mattress including a higher weight capacity, a larger width, a digital screen for entering the patient's weight. This advanced low air loss mattress system includes low air loss therapy and a pulsation mode for alternating pressure. 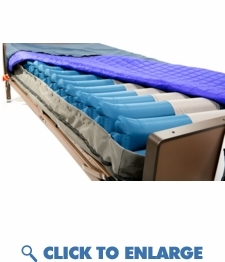 The bariatric low air loss mattress is our most advanced low air loss system supporting up to 1000lbs. The mattress is divided into 5 zones balancing pressure distribution from the head to feet for maximum patient comfort. This medical mattress provides exceptional protection against pressure, shearing, friction and moisture. Prevents and Heals up to Stage 4 bedsores. The following are some benefits of purchasing a bariatric low air loss medical mattress: � Wider than standard twin size hospital mattresses. � It is highly recommended for patients with any stage pressure ulcer, myocutaneous skin flaps, burn surgery, broken hips or replacements. � Functions include true low air-loss to keep a patient cool and dry preventing skin breakdown, alternating pressure to heal up to and including stage 4 bed sores, auto firm, seat inflation and system lock. � Low-shear, low- friction machine washable cover is easy to clean and fully encases the air cells. ONLY 5 LEFT IN STOCK AT THIS SALE PRICE!!!! 42"WIDTH X 80" LENGTH X 10" CELL THICKNESS OR 42" WIDTH X 84" LENGTH X 10" CELL THICKNESS USE PROMO CODE "USA50" FOR AN ADDITIONAL $50.00 OFF LABOR DAY WEEKEND ONLY!!!!!!! � Wider than standard twin size hospital mattresses. ONLY 5 LEFT IN STOCK AT THIS SALE PRICE!!!! USE PROMO CODE "USA50" FOR AN ADDITIONAL $50.00 OFF LABOR DAY WEEKEND ONLY!!!!!! !